Well, I did two things I’ve never done before. 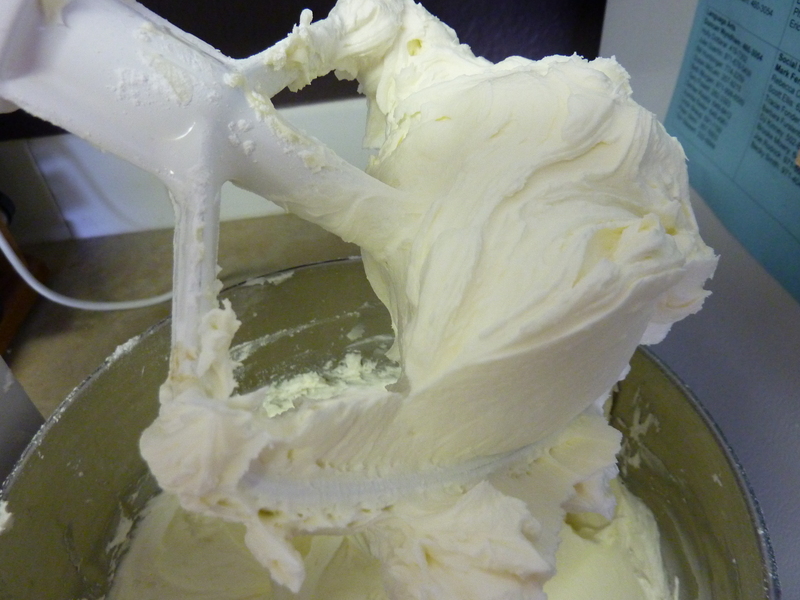 One, I worked with fondant, and two, I made buttercream frosting. 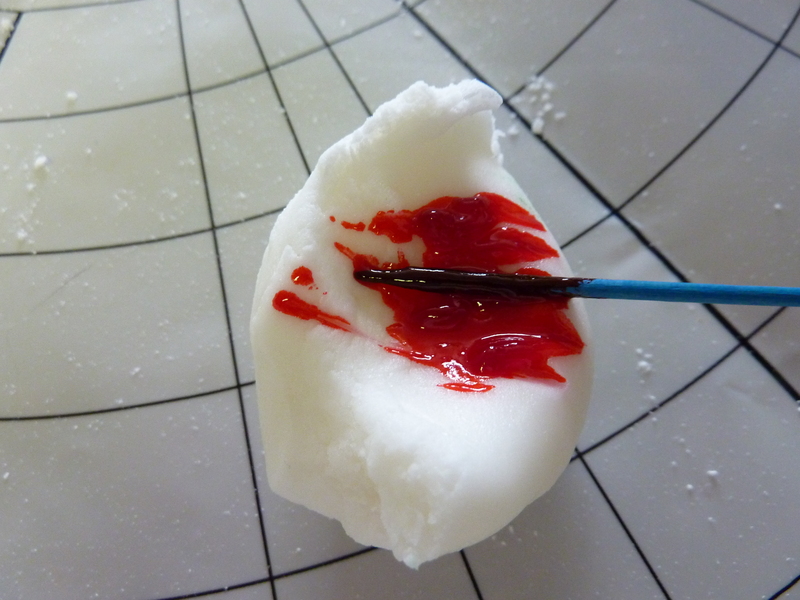 I had worked with Sculpy (modeling clay) before and it was pretty similar to fondant, so that was quite a bit of fun. 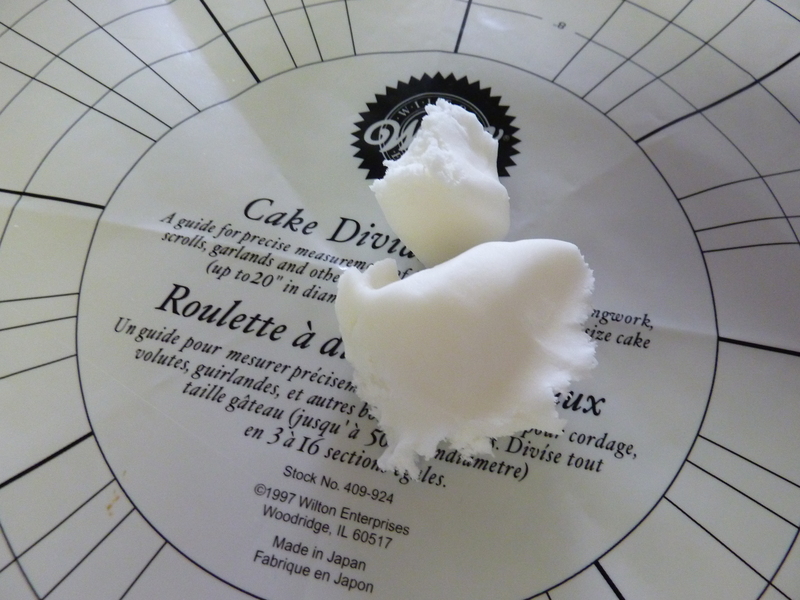 I don’t know why I thought fondant was so hard. 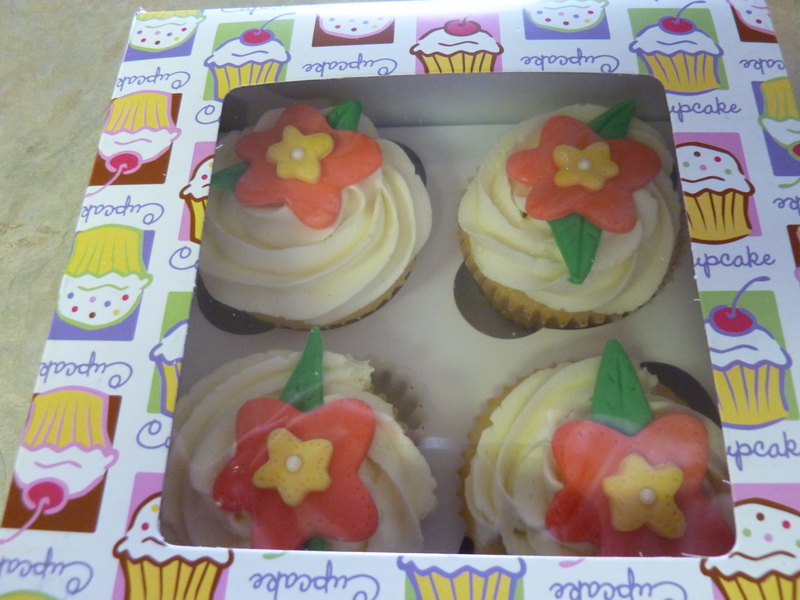 Granted, I didn’t cover a cake; I just made flowers. Someday, I’d like to make small figurines, but after doing some research on-line, I think I need to buy and work with gumpaste. But that’s for another day and another post. While looking up cupcake recipes, I can across this recipe from Food Network. 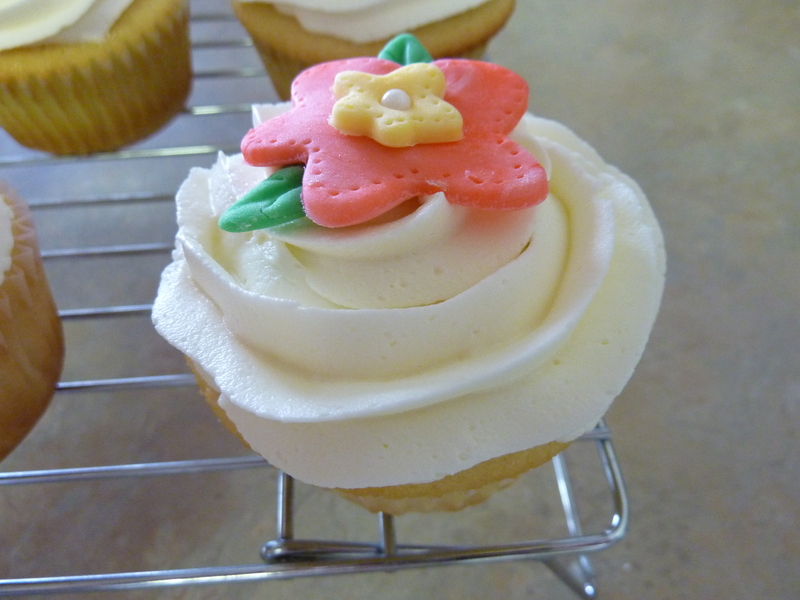 It is supposed to go with an old-fashioned frosting, but I decided to use a vanilla buttercream frosting from Martha Stewart instead (which I piped and had fun creating a large swirl on top of the cupcake). Boy, are these cupcakes sweet! Good thing I brought this to a dinner party (for the dessert, of course!) and was able to share this sugar rush with others, otherwise, I might have been tempted to eat all 24 of them. Getting out all the ingredients. It’s easier to cut the butter when it’s cold. 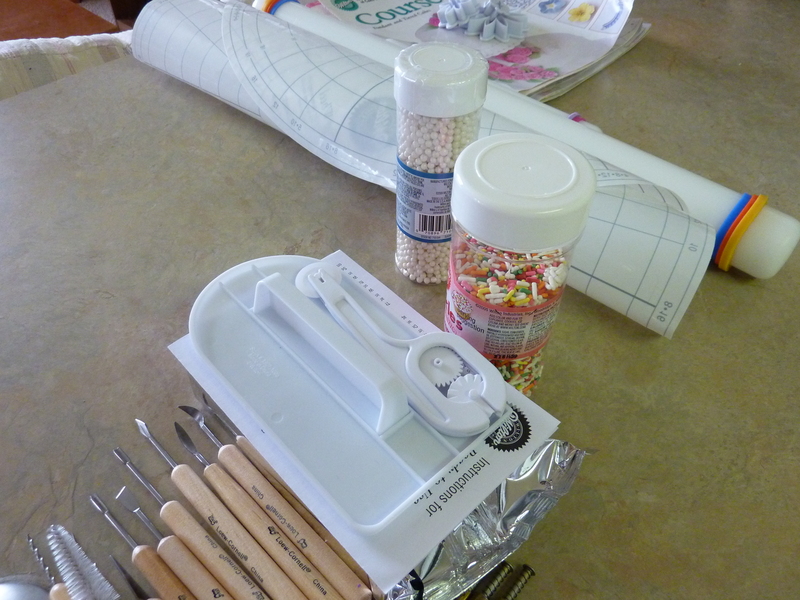 Mix the dry ingredients with the paddle attachment for about 3 minutes. 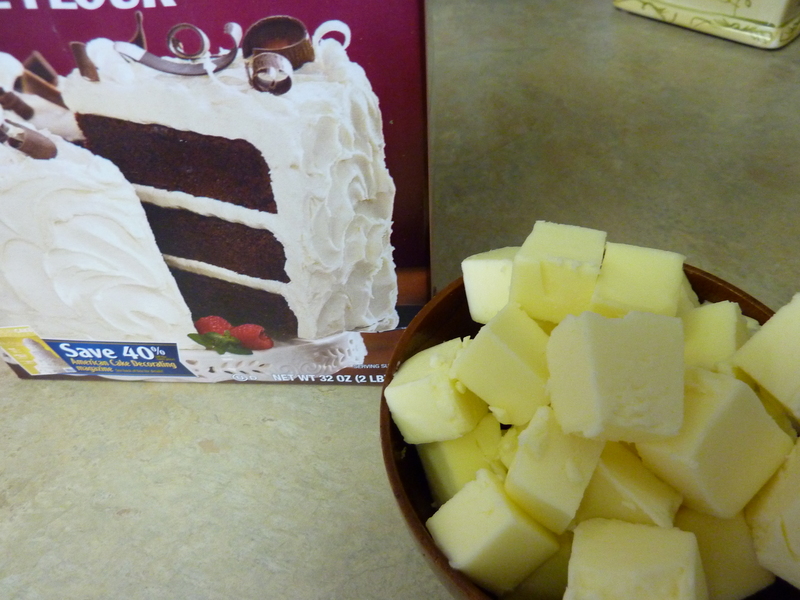 When you incorporate the butter, make sure that the pieces are broken up. You don’t want chunks of butter in the batter. Just watch it, so that you don’t mix the butter up too much and therefore create a denser cupcake. Once all the wet ingredients are incorporated, put it in the hot oven. Make sure you don’t fill the cups more than 2/3 full, otherwise, the batter will spill over. Almost ready to eat! 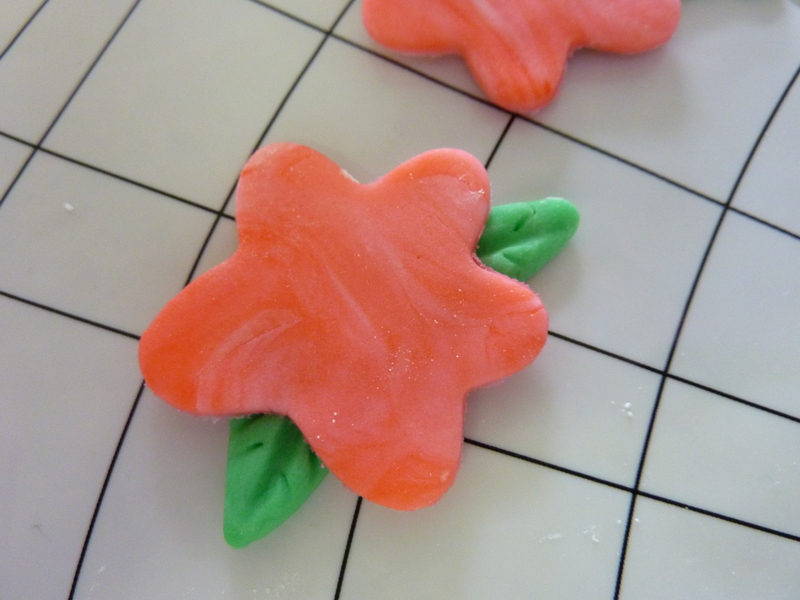 While they were drying, I begin working with the fondant. I got all the utensils out that I thought I might need. I pulled out a little fondant from the block. It is easier to add more, then to have too much. I decided I was going to make the leaves first. 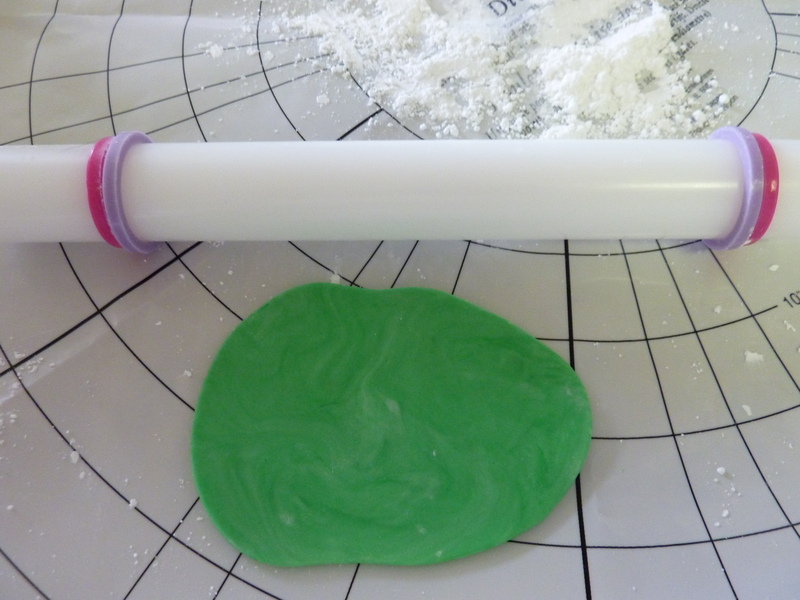 When rolling out the fondant, use powdered sugar to keep the fondant from sticking. I decided not to fully incorporate the green, and to leave it marbleized, to try to give it a more realistic appearance. I used pink for the flower, and took out the gel that I needed with a toothpick. All rolled and cut out, then added the leaves. Water works well as an adhesive here. The finishing touches now complete, it will need to dry for a couple of hours. On to the buttercream! When you are creaming the butter, after about 2 minutes, it should look like this. Once the powdered sugar and vanilla are beat in, you’ll end up with a nice, soft, yellowy color and light texture. 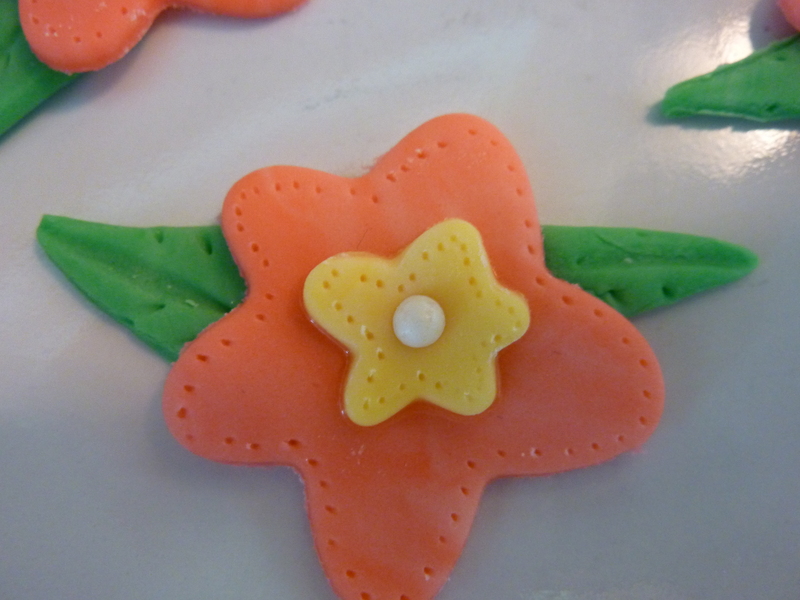 I piped the frosting and then placed the dried fondant flower on top. Combine in a bowl both flours, sugar, baking powder and salt. Mix on low speed until combined, about 3 minutes. Add in the cubed butter, mixing until fully incorporated. Add eggs, one a time, until combined. Slowly add milk and vanilla to batter until completely mixed in, scraping down the bowl as you mix. Scoop batter into baking cups, filling about 2/3 full. Bake until a cake tester inserted in the center comes out clean, about 17-20 minutes (there should be a nice golden top on the cupcakes). Makes 24 cupcakes. Notes: Make sure to mix the dry ingredients for the full three minutes. This fully incorporates the ingredients. Make sure that the oven rack is at most in the middle (do not put rack towards top of oven! ), and that it is fully preheated. 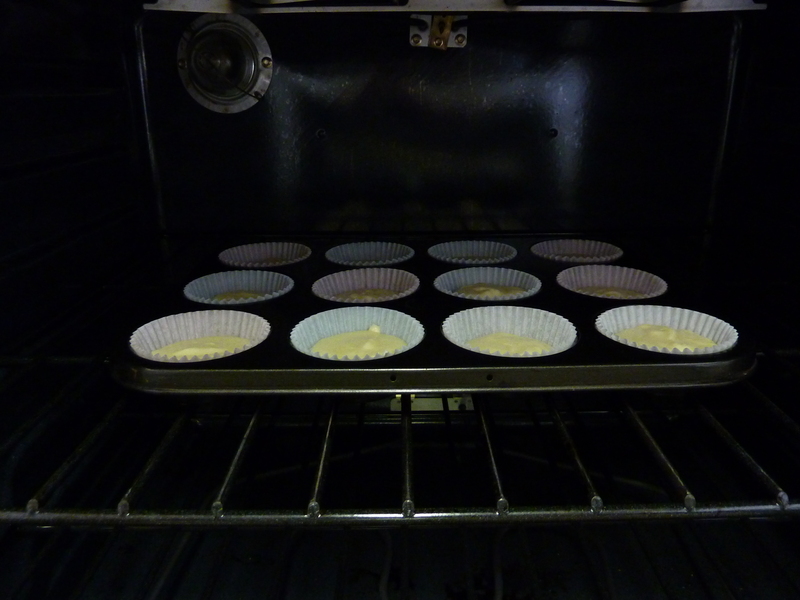 When the timer goes off on my oven, I wait about 5 or so minutes to put the cupcakes in. Lastly, cut the butter when it is cold and then put in a bowl, covered with cling wrap, until it reaches room temperature. 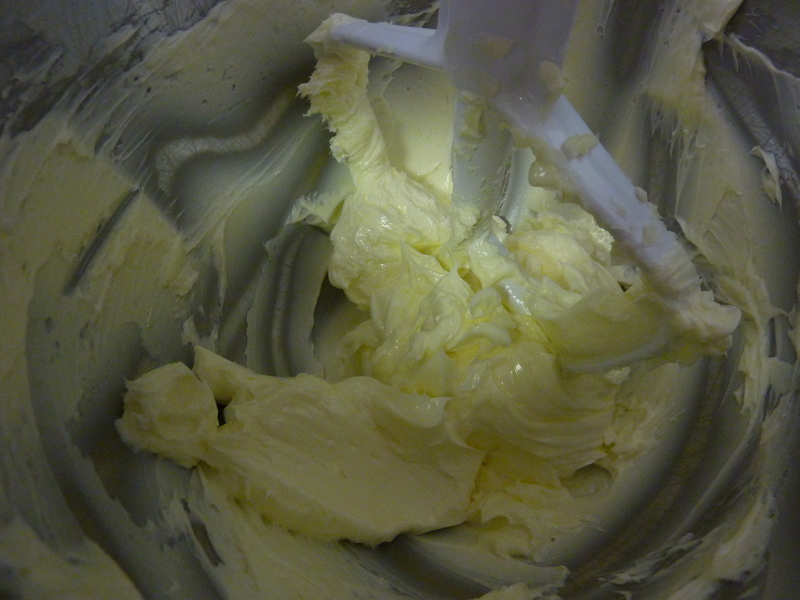 Using cold butter will not make the butter dissolve into the batter, leaving you with chunks of butter.